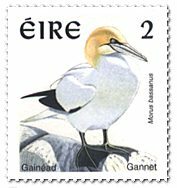 The gannet is a big seabird, when they are fully-grown they are about three feet or 91 cm in height. It looks like a huge seagull from a distance. His colour is white with black tipped wings. Close up it has a lovely yellowish head and a very sharp beak. Their favourite food is fish. Fishermen often follow them because where gannet is, fish can be found. They follow schools of herring and mackerel. It is great to watch them fish. They fly up really high in the sky and then when they spot a fish, they dive straight down under the water and come up with a fish. They have a pouch beneath their throats and that is where they hold the fish so as they can bring it back to their nest. The nest is made of grass mud and old leaves.They are usually found out on craggy rocks and usually do not come near people. There are special places to go and see them. They usually live in very large numbers, called colonies. One such group, live on the Little Skellig island, which is off the Kerry coast. There are about 20,000 breeding pairs there. It is said they have been there for at least 300 years. You usually have to get a boat trip to see them up close, you should also bring a pair of binoculars. There are two smaller colonies on The Bull Rock, Co. Cork and on The Great Saltee Island off county Wexford. You can get to the Saltees by going on a boat trip from Kilmore Quay. They live in these out of the way places so they won't be disturbed. I hope to go there someday soon as Wexford is next door to us here in Waterford. I am not living here very long. I enjoyed working on this project. We all learned a lot about birds and computers, but especially birds. The stamp was issued in Phase 2 on August 27th. 1997.